Senator Al Franken is one of the many powerful men who have been accused of sexual misconduct in recent weeks. And following the allegations that he groped several women, Franken announced his resignation in a speech on December 7th. In November, radio host Leeann Tweeden was the first to bring accusations against Franken, saying that he kissed her and groped her without her consent when the two were on a USO tour in the Middle East together. After Tweeden, several more women alleged that Franken had groped them during photo ops while he was a Minnesota senator. Senate Democrats had called for Franken’s resignation on December 6th after a sixth woman accused him of groping her. In today’s resignation announcement, Franken said he would resign in the coming weeks. Minnesota’s governor will pick his replacement until an election can be held. Franken didn’t apologize for his conduct in his speech. Instead, he claimed he was innocent and went on to condemn President Donald Trump and Roy Moore, who both have been accused of sexual misconduct. Franken’s supporters took to Twitter, applauding him for calling out Moore and Trump. Sen. Al Franken resignation speech was more eloquent that the @SenateDems who viciously attacked him. He called out #Trump, #RoyMoore when they did not. The #DemocraticParty have been greatly diminished by his leaving. Other supporters saw Franken’s resignation as noble and called on Moore and Trump to resign as well. The Al Franken resignation doesn’t move the conversation forward, it shuts it down. An investigation and hearings would have been better for everyone. Total mismanagement of a moment by everyone involved. Meanwhile Trump and Roy Moore will skate. BREAKING: Sen. Al Franken to resign. Now it's time for Trump to resign and Roy Moore to drop out. Oops... I forgot... democrats are the only ones with morals. But others felt that Franken’s speech didn’t acknowledge his own culpability. These users condemned Franken for using Moore and Trump’s behavior to distract from his own. Al Franken's resignation speech felt like basically every time my husband has said "I'm sorry you feel bad." 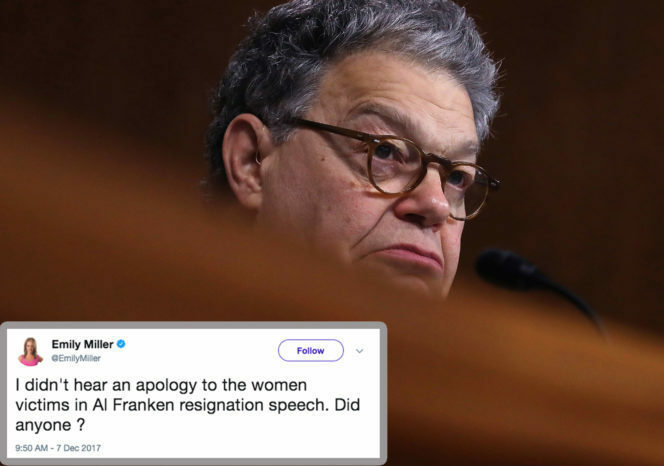 I didn't hear an apology to the women victims in Al Franken resignation speech. Did anyone ? And some thought Franken shouldn’t have resigned at all — including a few Congressional Republicans. Ultimately, we believe Franken’s resignation was the right course of action — though that doesn’t mean that politicians like Trump and Moore shouldn’t also be held accountable for their behavior. Additionally, it’s not enough for men like Franken to step down; they need to recognize what they have done and apologize. Only then can true progress be made. To Franken’s accusers — and all survivors of sexual harassment — we stand with you.